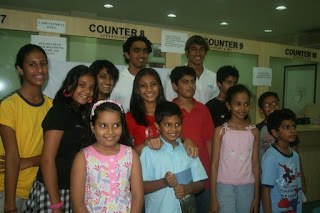 A group of India’s top swimmers – Virdhawal Khade, Sandeep Sejwal, Shikha Tandon, Rohit Havaldar and Aaron D’souza – participated in the 4th Singapore National Swimming Championships 2008, held from 4- 8th June. 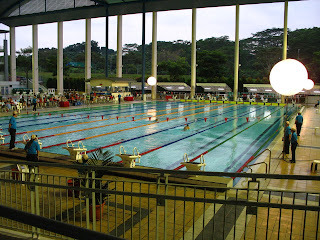 This event was a designated Olympic Qualifying event. It served as a good preparatory meet for the Olympic qualified swimmers – Virdhawal Khade and Sandeep Sejwal – and an opportunity for the others to earn their Olympic berth. Virdhawal Khade won two gold medals – 50m Freestyle (23.38sec – meet record) and 200m Freestyle (1min 53.57sec), one silver medal – 100m Freestyle (51.69sec) – and one bronze medal – 50m Butterfly (25.33sec). Sandeep Sejwal finished 3rd overall in the 200m Breaststroke (2:21.38sec) and 5th overall in the 50m Breaststroke (29.96sec). Both Virdhawal and Sandeep were swimming this meet in the middle of a high intensity training cycle and did not taper for this meet. Taking this into consideration their performances were creditable. Shikha Tandon won one gold medal – 50m Freestyle (26.38sec – meet record) – and one bronze medal – 100m Freestyle (58.26sec). In the 50m Freestyle, she again came excruciatingly close to making the Olympic cut, this time missing it by 0.06sec. 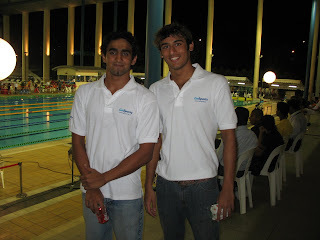 Rohit Havaldar won two gold medals – 200m Backstroke (2:08.29sec – meet record) and 1500m Freestyle (16:24.12sec) – and two silver medals – 200m Freestyle (1:57.24sec) and 400m Freestyle (4:04.39sec). Aaron D’souza won a gold medal – 200m Butterfly (2:03.93sec), finished 5th in the 100m Freestyle (53.51sec) and finished 6th overall in the 100m Butterfly (57.47sec). The Indian Women’s Association and The India Club organized interactive sessions with Olympic qualified swimmers – Virdhawal Khade and Sandeep Sejwal – at the Indian High Commission. Through events like these we hope more Indians living abroad will get excited about the talent that exists in India.